Golconda Fort is one of the finest sights of Hyderabad. 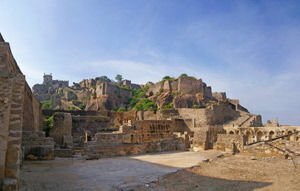 Golconda is located in the western suburbs of the fifth largest city in India. The site is located 11 kilometers from Hyderabad. Golconda Fort rises majestically over a 120 meter high granite hill. It is a vast complex of ancient buildings which were once home to ancient Indians. Perhaps the greatest attraction is its Golcondan perfect sound system. The ancient fortress was built in such a way that if a man slapped his hands in front of the main gates of the ancient city - the sound will be heard in the farthest point of the fortress, located over 100 feet away. The design and architecture of the village are actually impressive. Air movement is also considered excellent. The village is built so that it continuously circulates fresh air. Even more interesting is when you learn that it is in place where Golconda is once mined were extremely beautiful and valuable diamonds. Years ago it was considered that India is the only place in the world with diamond mines, one of which is Golconda. The area subsequently became a major trading center for diamonds. Many of today's famous diamonds come from areas located near the Golconda Fort. It is believed that it was from the area around Golconda originates the popular Kohinoor diamond. The old city of Golconda was built by rulers such Kakatiya's, in the XIII century. Subsequently the castle was extended and renovated by the rulers like Qutub Shahi. Today visitors can see the majestic granite remnants of former life of local residents. Generally the Qutub Shahi is known as one of the largest builders in India. In Golconda are located the graves of kings like Qutb Shahi (Quli Qutb Shahi Tombs), found in buildings with majestic Islamic architecture. Around them are superb gardens, as well as many engravings, creating a great atmosphere to walk and relax in. Legends tell of the occasion to build a fortress more than 7 centuries ago. According to the beliefs of those places, a shepherd saw the image of a holy person. Therefore, in these sacred lands the then local rulers decided to build a settlement. Actually the name Golconda literally means "hill of the shepherd". Among the biggest attractions of the castle are the highest point of the settlement - Bala Hissar, as well as the famous Rahban cannon. Interesting is the building Kala Mandir. The site keeps the remains of well-built water and irrigation systems. A brilliant finish to the top tourist destination in Hyderabad is a sound-light show, held in the Golconda Fort. Through sound and light the show of local and English, tells the history and traditions of the ancient Indian village. The attraction begins at 6 or 7 pm. It should be noted that English is only a presentation on Wednesday and Sunday and lasts 55 minutes.